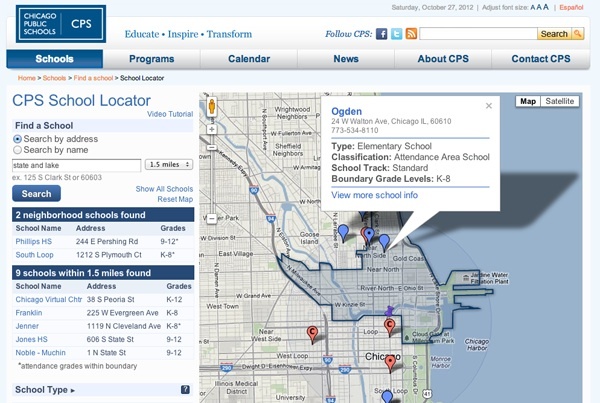 On August 17, 2012, Chicago Public Schools (CPS) launched a new version of their School Locator -- an online map that helps parents find public schools for their kids. Unlike the map that came before it, this one is intuitive, easy to use, and took half the time to build. Governments usually build web apps like this one by hiring private contractors through a process called procurement. They publish a "request for proposals" describing the project, and companies bid for the contract. Procurement is long and bureaucratic, often leading to inflated bids by a small group of companies that know how to navigate the process. In March of 2012, civic hackers at Open City (myself included) launched Chicago Public School Tiers, an app to help parents enroll their kids in Chicago's selective schools. In Chicago, selective schools only admit a certain number of students from each of the city's four socioeconomic "tiers." What tier you live in really affects which schools you should apply to. But before we built the app, finding your tier was a huge ordeal. We built the app using free Google tools: Google Maps to gave us an interactive map of Chicago, and Fusion Tables stored the locations of the city's CPS tiers. The map's ease of use and value to parents attracted CPS's attention. If a group of civic hackers could put together a useful tool for parents in their spare time, could they do the same? Alex Soble, CPS Director of Social Media, wanted to find out. 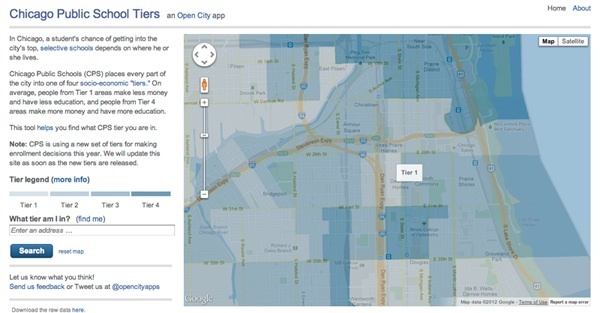 He asked CPS web developers Jay Van Patten and Ted Canji to look into the free map template that powers CPS Tiers, and they used it build a functional prototype of the School Locator map in under three days. By avoiding procurement, Jay and Ted had time to get feedback on the app from CPS staff, parents, and Chicago technologists, leading to a better product. Just eight weeks after starting the project CPS launched its new School Locator map, to rave reviews from CPS parents and students. Parents and students won. 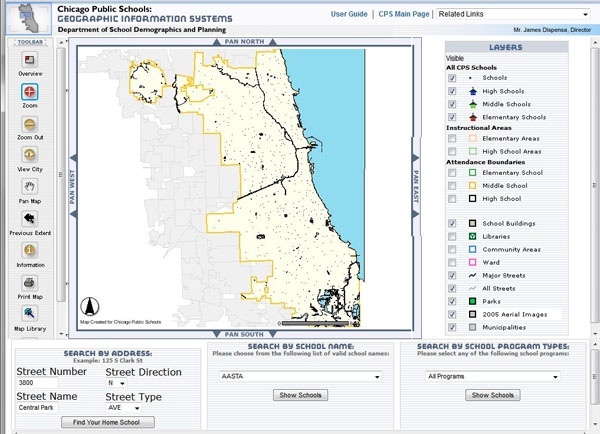 They now have an intuitive tool to help them navigate Chicago's schools. This is a tiny victory in a much larger struggle: making digital public services radically more user-friendly is probably the key tech challenge for government in the digital age. CPS's web team learned new skills. Going forward, they can make countless interactive maps. In September 2012, Chicago's schools closed during a teacher's strike. The web team was able to quickly build a map of alternative places for parents to take their kids.